It is a color photograph of one of my patients, diagnosed with wet macular degeneration, who has suffered a devastating hemorrhage. 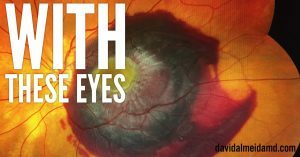 Her vision is worse than legal blindness and, due to several factors, the prognosis is poor for any vision improvement. So, what do you see in this picture of pathology? Do you see a foregone conclusion? A lost cause? A chance for a miracle? Hope in a complicated case? Consequences of a blinding condition? Do you fight for any gain, at any cost? Or do you accept and move on preferring to first, do no harm? TASK AT HAND: This week I’m thinking about perspective. Where the painting tells the story, perspective is the frame. Perspective, must be congruent to the painting of houses, to accurately engage the conflict or decision in question. I think of perspective as the ability to see beyond the literal – to read between the lines – and akin to emotional intelligence. Perspective is to see beyond what meets the eyes. Without it, one is tone deaf. Perspective affords you the ability to decipher in real time, rather than in a vacuum. As a surgeon, I’m lucky because I get to develop a frank dialogue with my patients so that we can decide, through informed and shared decision making, on a path to purse together. I provide my professional opinion – but ultimately – we decide together. My perspective in these situations combines a mix of the unique patient before me and the knowledge, experience, and instinct within me. I must never disregard this perspective. For the decisions in our lives, many of the times, we are not so lucky as to have a second vantage point on decision making. This is one of the reasons why fallacies and bias are so troubling and can cause much of misguided strategy. As we bounce possibilities around, they can become extricated from reality and adorned with bias. Now, what does providence have to do with any of this? Providence can be defined as protective care from a higher power such as nature, spiritual forces or religious deities. But, I use it here as defining the timely preparation for future eventualities. Providence, to be prepared for the future, can be found in perspective. In other words, to have perspective and insight, provides preparation for what you may encounter in the unknown path in front of you. For all the apparitions of darkness, joy, pain, success, and failure that you may encounter, find providence in perspective. Use perspective for comprehension. Let your execution be guided by providence. 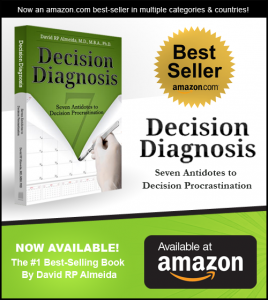 MEDICINE & MACULA: If you haven’t had a chance, check out my new book, Decision Diagnosis: Seven Antidotes to Decision Procrastination. For those who have already gotten their copies, sincere thanks for your interest and for making it an Amazon best seller in multiple categories and countries! Both paperback and Kindle versions are available here.